The Chatham & District Traction Company was formally absorbed by the Maidstone & District Motor Services on 30th September 1955 (It had been a subsidiary of Maidstone & District since 1930 when its new fleet of Leyland Titans replaced the Medway Towns’ tram network). There was little outward change initially, although the more observant would have noticed that all buses now carried the Maidstone & District scroll fleetname. The new fleetnames were applied overnight at Luton depot. They had been specially printed on paper with an apple green background to blend with the old Chatham colours. The routes and timetables continued as before with only minor alterations to timetables and the addition of a “T” (for Town Service) prefix to the service numbers. GKR 748 lays over between workings in Globe Lane. It had worked the last Chatham Traction service into Luton depot on 30th September 1955 and the first M&D service out the following morning. The M&D fleet name is visible, and the route prefix “T” is already set in the front display. Dockyard section replaced by new service 143 (from Rainham); Burma Way section to new services 140/141 (to Temple Farm and Warren Wood). 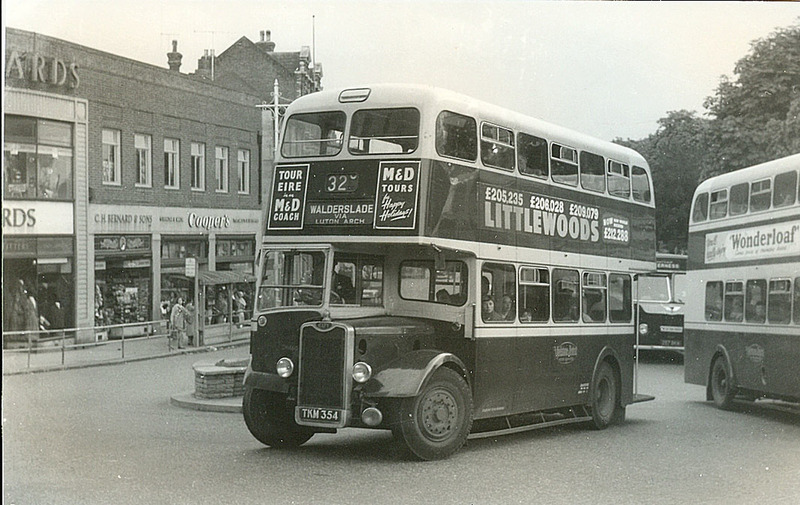 Replaced by M&D services 19 and 65 operating from Hoo and Grain and extended to Gillingham Green. Brompton Farm Road section replaced by service 66 to Davis Estate and new service 147 to Wagon-at-Hale. Replaced by new service 144 between Salters Cross and Chatham Town Hall; Wagon-at-Hale and Burma Way sections transferred to new services 147 and 140/141 respectively. Frequencies varied between 10 minutely to hourly and were not significantly higher than daytime services today but, unlike today, Sunday and evening services were generally at the same frequency as weekdays. The Medway Towns have expanded significantly during the five decades since the disappearance of Chatham & District. The bus services of Maidstone & District, and subsequently Arriva, have changed to reflect this but it is still possible to trace the old Chatham Traction route network within the present day route pattern. FKL 615 (48 seats) – numbered 355 and renumbered DH 292. This carried a 1936 body and was withdrawn in 1957. 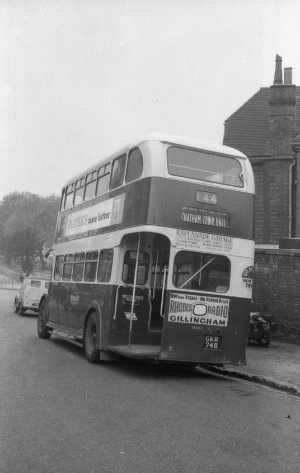 GKE 93 (DH 311) rests in Globe Lane. Numbered between GKE 64 and GKE100 (870 to 906), and renumbered DH 293 to 317. This batch retained their original bodies and were already in the course of withdrawal. Many were never repainted whilst a few never even operated with M&D. The last was withdrawn in 1957. GKR 748 (DH 440) lays over in Barrier Road having come off a 144 service from Salter’s Cross. It carries its M&D depot allocation plate - “C” for Chatham (Luton). GKR/GKT registrations (56 seats) – numbered 907 to 912/915 to 920 and renumbered DH 440 to 451. These were wartime utility buses and had received new bodies in 1950/51. All were repainted into M&D colours and the last was not withdrawn until 1963. TKM 354 (DH 460) turns from Military Road towards the Brook and heads for Walderslade on a 32, one of the re-allocated routes following the 1956 changes. RKK 992-999 and TKM 354-361 (58 seats) – numbered 921 to 936 and renumbered DH 452-467. All were repainted and the last was withdrawn in 1969. VKO 992-999 (60 seats) – these eight vehicles were ordered for Chatham & District but not delivered until after the take-over and therefore were new in M&D livery and numbered DH 468-475. The last was withdrawn in 1970. The only known Chatham Traction survivors are GKE 65 (converted to a lorry before the take-over) and GKE 68 itself – the main object behind the formation of The Friends of Chatham Traction. Additionally, Maidstone & District FKO 223 is in preservation; this is a 1939 Leyland Titan TD5 which operated for Chatham & District (as no. 293) from new until 1942, when it returned to M&D. 1939 Bristol GKE 65 as a Lorry with M&D in the early 1960s.